Recently we visited a restaurant I haven’t been to in a long time. The Spaghetti House Trattoria is a family-run Italian restaurant in Southbank. They were previously situated in West End, which is where we used to frequently visit them. They offer a great selection of Italian fare, including bread, small share plates, pizza, pasta and main dishes. The dishes are a collection of regional favourites prepared very traditionally. Over the years we have tried many of their dishes and they never disappoint in taste and quality. Over the past couple of years, they moved from Westend to Southbank on Little Stanley Street. The new location does feel a bit more formal than the previous one and is styled like a modern trattoria. From the polished floors, beautiful rustic table settings, lighting and gold framed mirrors, everything is perfectly elegant, yet cozy. On the day we visited we were all really hungry and were craving pasta. We all ordered the thicker kinds of pasta with simple sauces. 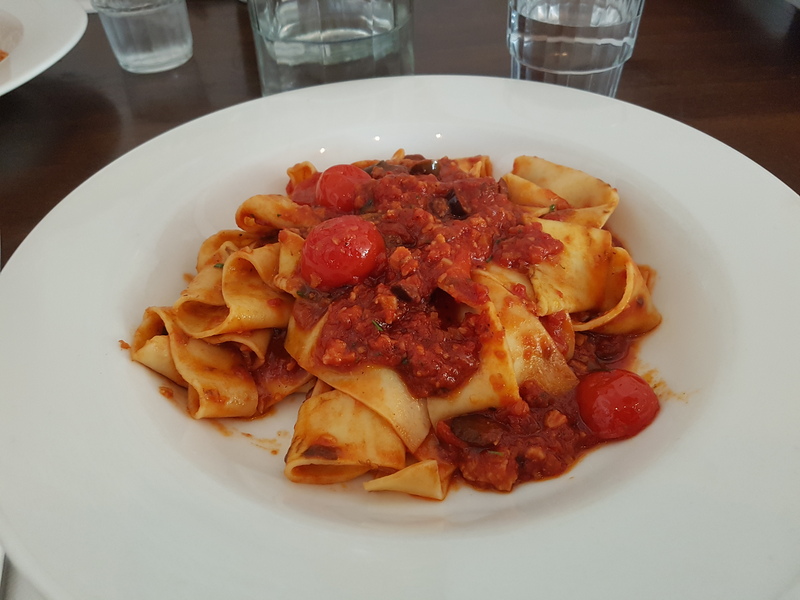 I had the Pappardelle Boscaiola, which had pancetta, porcini mushrooms and olives in a fresh tomato sauce. The fresh pasta was cooked perfectly al dente and the sauce had a full depth of flavour. 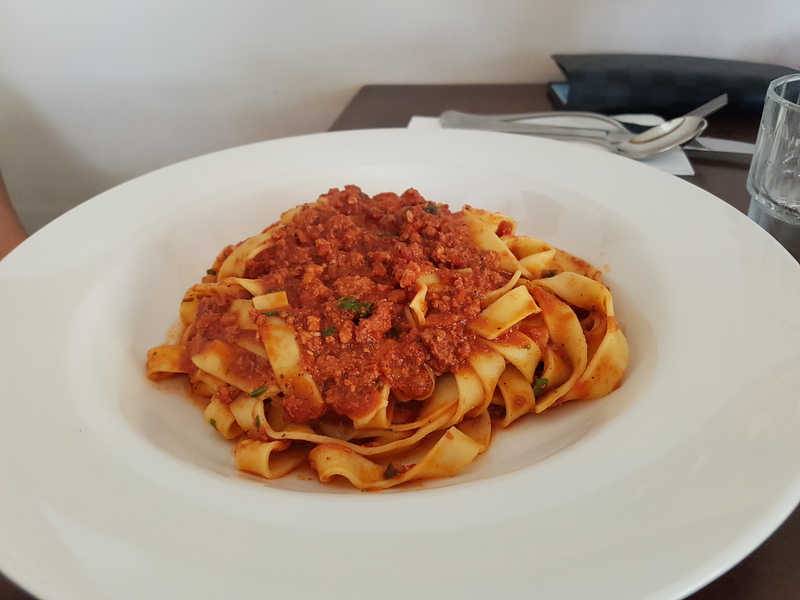 My companions had Pappardelle Carbonara and Fettuccini Ragu alla Bolognese. They were also very happy with their dishes. We all ordered the larger size plate, which were generous and very filling. If we ordered more food, I’m sure a small portion would have sufficed. 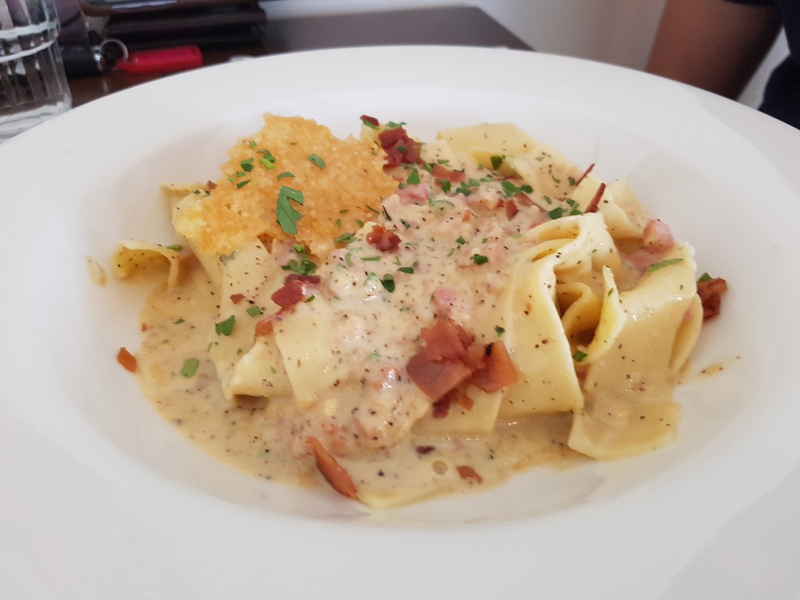 If your looking for a nice restaurant to impress, for a special occasion or just because you want decent Italian food in Brisbane, The Spaghetti House Trattoria is a good choice. Yummm!! Experiencing crazy food envy here! I must go!